(0 Customer Reviews) | Write Review 6 issues per year Danza&Danza is the leading Italian dance magazine. Dedicated to ballet and dance since 1986 and published in Milan, it offers bimonthly interviews with dance stars, news from the Italian dance scene, reviews and features on ballet and contemporary dance plus a shopping section. The Danza&Danza International edition is not simply a translation of the Italian magazine (print and digital), it has been created with an international audience mind. An edition for anyone who wants to find out more about great Italian theatres and festivals. Includes multimedia contents exclusively available on the app. 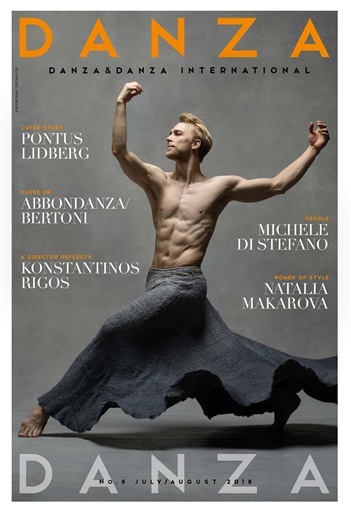 This issue presents the highlights of the Italian summer season: Mikhail Baryshnikov, Boris Charmatz, Michael Clark, Ben Duke, John Neumeier and Bill T. Jones are just some of the personalities who will be visiting the length and breadth of the ‘Bel Paese’ this summer, alongside great classics such as Nureyev’s "Don Quixote" at La Scala, a new "Romeo and Juliet" for the Rome Opera Ballet and a Nureyev Gala at the San Carlo theatre in Naples. Pontus Lidberg, the Swedish choreographer and filmmaker now helming the Danish Dance Theatre, will be in Italy this summer to premiere his latest work, "Siren". We went to meet him. We also introduce you to Michele Abbondanza and Antonella Bertoni, a distinguished couple of Italian artists, who tell us about their new projects; and the choreographer and performer Michele Di Stefano, founder of the Rome-based mk company, who discusses his philosophy of movement. Konstantinos Rigos is the brand new director of the Greek National Ballet, the country’s only surviving state ballet company; he reveals his thoughts on the future of the ensemble, and describes its futuristic new home designed by Italian world renowned architect Renzo Piano. Alisa Aslanova is a young former ballet dancer and now a dance photographer with a glamorous streak. We went to meet her in Moscow. This issue’s reviews take a look at Anna-Marie Holmes’ Le Corsaire, now part of La Scala’s repertoire; Eleonora Abbagnato’s performance as Manon at the Rome Opera; the homage to Bergman by Mats Ek and Ana Laguna; the Dresden Frankfurt Dance Company, and the Prix Benois in Moscow. And to top it all off, we also have a profile of a Russian soul in the West, the inimitably charming Natalia Makarova. Danza&Danza is the leading Italian dance magazine. Dedicated to ballet and dance since 1986 and published in Milan, it offers bimonthly interviews with dance stars, news from the Italian dance scene, reviews and features on ballet and contemporary dance plus a shopping section. The Danza&Danza International edition is not simply a translation of the Italian magazine (print and digital), it has been created with an international audience mind. An edition for anyone who wants to find out more about great Italian theatres and festivals. Includes multimedia contents exclusively available on the app. You'll receive 6 issues during a 1 year DANZA&DANZA International magazine subscription. You'll receive 6 issues during a 1 year DANZA&DANZA International magazine print subscription.